Sunday, March 20, 2006 at 11:00 a.m.
On Tuesday, March 14, 2006, LYNN PAPPAS MARCHONE KANASKIE of Silver Spring, MD. Beloved daughter of the late Gus and Josephine Pappas. She is survived by her loving husband, Donald "Monk" Kanaskie; cherished daughter, Deana (James) Walsh; stepson, Eric (Charity) Kanaskie; adored grandchildren, John Paul and Vincent James Walsh, Kristen and Elizabeth Kanaskie; beloved siblings, Robin Walter, Chris Pappas, Charles Pappas and Debra Steffes; a host of other relatives and friends. On Sunday, March 19, visitation will be held from 2 to 4 and 6 to 8 p.m. at HINES RINALDI FUNERAL HOME, INC., 11800 New Hampshire Ave., Silver Spring, MD. On Monday, March 20 at 11 a.m., funeral services will be held at the funeral home. Entombment will follow at National Memorial Park, Falls Church, VA. In lieu of flowers, contributions may be made to Montgomery Hospice/Casey House, 6001 Muncaster Mill Rd., Rockville, MD 20855. Survivors include her husband, Donald "Monk" Kanaskie; daughter and son-in-law, Deana & James Walsh; stepson & his wife, Eric & Charity Kanaskie; grandchildren, John Paul & Vincent James Walsh, Kristen & Elizabeth Kanaskie; siblings, Robin Walter, Chris & Charles Pappas, & Debra Steffes. 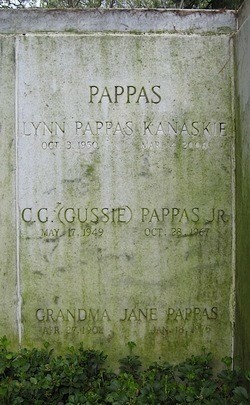 She was preceded in death by her parents, Gus & Josephine Pappas. Interment followed funeral services conducted Monday, March 20, 2006.